Gravel driveways are a popular paving surface choice that have stood the test of time. 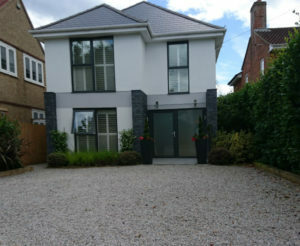 For those that live in the country; gravel can be the must have and always looks great outside bigger houses. Gravel is one of the most cost effective driveway surfacing choices and drainage is seldom an issue. Installing a gravel driveway is a simple DIY job as long as accurate measurements are taken and the right quantity of stone is ordered. There are plenty of gravel colours to choose from and types including Limestone, Dolostone and Granite. Combinations of gravel can also provide an individual look. As long as a membrane is in place any weed growth will be minimal. Increasingly new installations are laid on gravel grid systems and these both improve stability and the displacement of gravel.